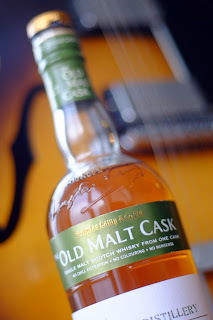 The malted weapon of choice was The Old Malt Cask 36 year old from Dallas Dhu Distillery (herein referred to as DDD). This D.T.W.C. meeting was pre-labelled 'The Demolition Edition' because of imminent building works at my place. A fortuitous selection of words, with the contents of the chosen whisky knocked down by members in quick time. If only my renovations were finished this quick, and approval from council this tasty. This hallowed water comes from a deceased distillery. In fact the DDD is now in state ownership, comrade. It closed down after a long drought. I say they should have run a pipe from the nearest Loch to this venue and rode it out until the heavens opened. Of course the positive take on state ownership is that it brings a cask full of apathy with it. What does one do with a closed down distillery? I could imagine the various committees gathering to advise Historic Scotland what to do with the now heritage location and stock, only to hold another meeting a year later after resolving nothing. And then another year. Which plays greatly into the very simple task of ageing whisky. They knew their assets were going nowhere. In fact, only getting better. So, what’s the rush? Well, god bless the public service’s modus operandi because at 36 years, this is living proof that patience has its rewards. Their miserly dispensing of the remaining stock is disciplined too. Much like that other Scottish wonder, the Dundee Cake, you don’t want to give away greatness too quickly even if you've got tonnes. This DDD expression received a mere 161 bottles. I’m guessing there must be some cracking 40+ year old coming out at some stage. The drinking experience is glorious in it’s build. The nose promises sweetness. Not, I’d like to note, in a Glenmorangie kind of way though. The bottle notes mention citrus as well. The palette is full bodied sweet. Bottle notes say syrupy. I’m going to say honeycomb. Maybe even a Violet Crumble, pre 1995. The finish is lingering. The sweetness disappears, the mouth feels clean and I’m left dreaming of middle eastern orange cake.